We filmed a short video for this recipe. You can view it below. For more recipes, you can subscribe to my You Tube Channel. 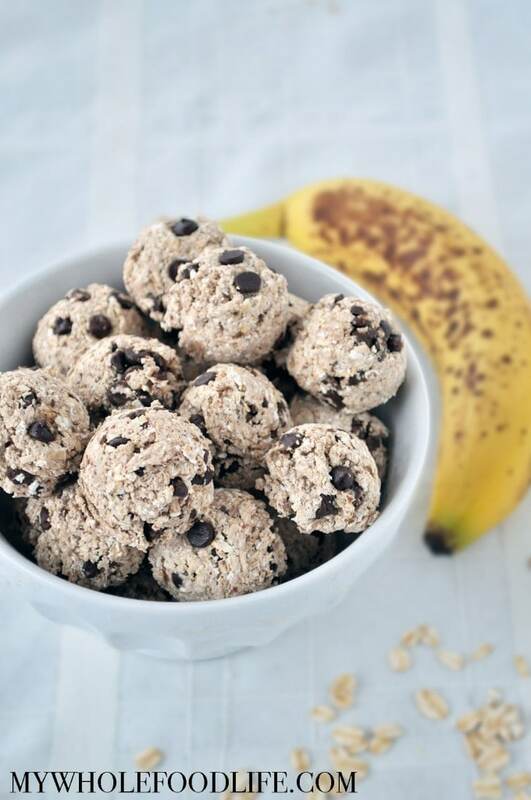 Just 4 ingredients to make this healthy snack! In a food processor , combine all ingredients, except the chocolate chips. Once everything looks mixed well, add in the chips and pulse a few times. Using a cookie scoop , drop energy bites onto a lined baking sheet . Keep these in the fridge in an airtight container. They should keep at least a couple weeks. They can also be frozen for longer storage. Enjoy! I really like this recipe. I had some ripe bananas and no time to bake banana bread, so this was an ideal alternative. Easy and tastes great! These are so simple! Perfect for snacking! Thank you these are delicious! Any idea of the calorie count, etc? Hi Hillary! So glad you like them! You can upload the recipe into my fitness pal for a rough estimate. These are just what I need right now!!! I see the recipe makes 25 bites but what's the serving size, 1? My son does not like balls, can I make these more into a cookie shape?! Sure. You can flatten the balls with your hand so they are more like a cookie. I had quick oats. Used a whole cup of them and it still came out a little moosh. Also only made 12 with my cookie scoop. Guess I need a smaller scoop. Quick oats will end up mushier because they are smaller and not whole. Sorry that happened.